Fr. Thomas Price whose cause for sainthood is under investigation founded our parish. He named it for the favorite saint of a major benefactor, Saint Katherine Drexel, namely, Saint Catherine of Siena.. It was a small rural parish when he founded it so many years ago, and it has remained so over one hundred and twenty years. 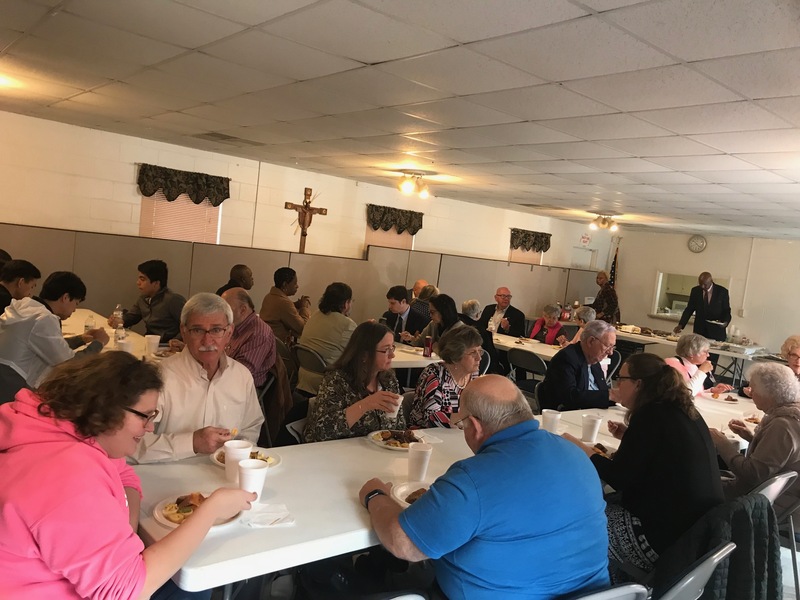 The main purpose of the parish is to provide liturgy and sacraments to Roman Catholics in this area of North Carolina. One goal over and above this is to teach the Catholic faith to our young people and give them the opportunity to receive the sacraments of initiation. Another goal is to reach out to those who separated from their Catholic faith because of difficult circumstances,especially sickness and poverty. There are two communities. One is English speaking and the other Spanish speaking. El Padre Tomás Price cuyo motivo para la sanctidad está ahora siendo investigado fundó nuestra parroquia. La nombró por la santa favorita de una benefactora importante, Santa Katherine Drexel, es decir, Santa Catalina de Siena. Fue pequeña y rural cuando se la estableció hace tantos y perteneció así. El proposito principal de la parroquia es para proveer liturgia y sacramentos a los Católicos en la área. Otros propositos son dar enseñazas sobre la fe a los que están buscando los sacramentos de iniciación y extender la mano a los que están separados debido de circunstancias duras como enfermedad y pobreza. Hay dos comunidades. Una habla inglés y otra español. Join us at 10 AM on the first Sunday of the month for a delicious brunch. All are invited to share a time of fellowship and good food with fellow parishioners. Faith Formation is both sacramental preparation and faith enrichment. Sacramental preparaton for the initiation sacraments consists in baptism prep and classes for first communion, confirmation as well as first confession. We also offer classes in our faith for children who have received their first communion but are not old enough for confirmation as well as a class for youth who have been confirmed and for adults who want to study the faith. These classes are subject to the space and time constraints of the parish facilities and the teachers. La formación de la fe consiste en tanto la preparación para los sacramentos como el profundizar de la fe. Preparación para los sacramentos de iniciación consta las pláticas prebautismales y las clases de primera comunión y primera confesión, y también las clases de confirmación. Además ofrecemos las clases para los adolescentes que han sido confirmados así como los adultos que quieren profundizar el conocimiento de la fe. Estas clases son sujetadas a los restriccones del espacio de los edificios parroquiales y el número de los maestros y las maestras disponibles para enseñar la clase.